This charming square full of astonishing palaces and houses is one of the access points to Prague Castle. Interestingly, it has retained the appearance of the medieval square. 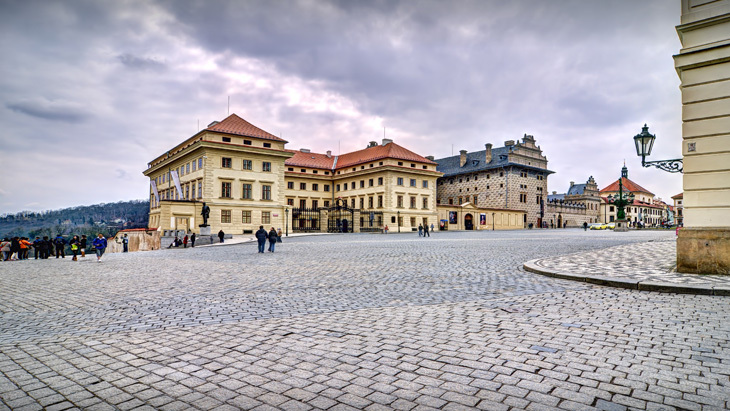 After the great fire of 1541 many features of the Lesser Quarter above Hradčany changed a great deal, and both secular and ecclesiastic palaces were built in the square. Concerning the historical monuments, Hradčany Square is one of the best-preserved districts of Prague. Dominated by a plague column of Virgin Mary created by Maxmilián Brokoff the square is surrounded by spectacular buildings, such as Schwarzenberg Palace, or Salmov Palace not to mention the great view of the city you will get from here. Thanks to its fabulous mixture of Baroque and Renaissance buildings this square had a prominent role in the film Amadeus. The house No. 7 was used as Mozart’s residence, and the rococo Archbishop Palace, on the left as you face the Castle, was the Viennese archbishop’s palace. Madeleine Albright lived in the house No. 11 for a brief time after World War II.